I love a good bar. I don't mean the tavern/pub type of bar (although that type of bar is obviously my favorite thing in life), but the kind of mini buffet of specially themed treats. I'm talking taco bars, candy bars, mashed potato bars, etc. They're a unique way to serve something that impresses your guests while actually being super easy to pull off. My favorite fun bar for this time of year is a spiked hot chocolate bar. I mean sure chocolate is great, but have you had chocolate laced with vodka? You can set it up to be a beverage option during a holiday party or during gift exchanges on Christmas so it doubles as an excuse to take a break from your politically-opposite relative. If you get a little more aggressive with the topping options, it could be the dessert at your party. 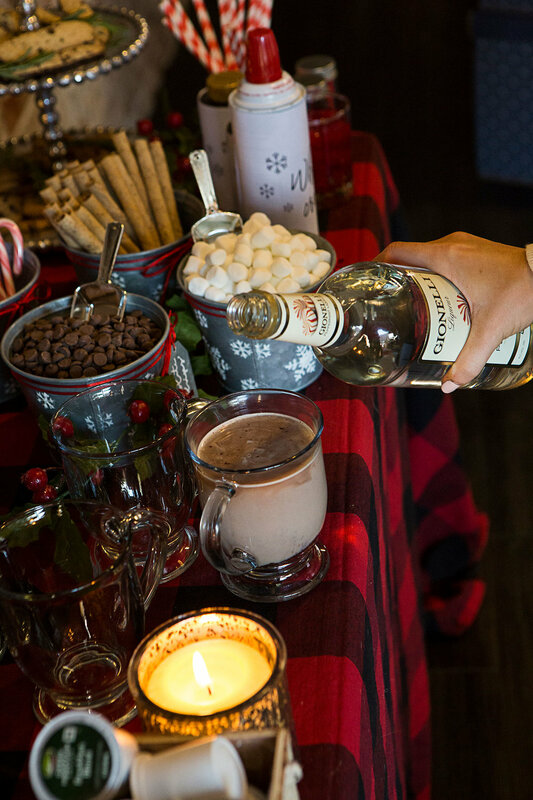 All you need to create the spiked hot chocolate bar of your dreams is hot chocolate, some toppings, mugs, booze and décor. For this part, I think the easiest and best way to keep your hot chocolate warm is to bust out the Keurig and offer different flavors of hot chocolate pods. Then you can make suggestions on fun combinations, like peppermint hot chocolate + whipped cream + marshmallows + Baileys. I like this assortment by Crazy Cups. The finishing touch for a hot chocolate bar is good signage and labeling. It's really what takes it from "aw I get what you were trying to do" to "oh hell yes you little Martha Stewart, you!" The good news is I've handled almost all of that for you. I have a few sign options you can download below and then follow the simple printing instructions. As long as you have a FedEx Office nearby, you can do it. Find your nearest Fedex Print and Ship Center. Choose "Mounted Posters" if you would like for it to be mounted, if not, you may choose "Posters and Prints"
Select "Continue to print options"
Be sure to change the size of the document settings to 18"x24"
For the whipped cream and syrup labels, simply print and trim them so they fit the bottles. I used Ghiradelli syrups and Trader Joe's whipped cream. Special shoutout to Kathleen Baird for designing the signs and labels. You go girl.